"Did such a man as Alexander exist? Of course not. We idolize him, make him better than he was. All men reach and fall, reach and fall." The original release of Oliver Stone's Alexander was greeted with widespread derision (and also controversy, due to its treatment of its subject's sexuality). Stone tried again with a revised director's cut that actually made the movie shorter rather than longer. In 2007, Stone tried yet again, this time supposedly including virtually everything that was shot, in an effort to try to get across his obsession with Alexander. While a great deal of thought and effort has gone into this Revisited version, it still falls substantially short of its goals. 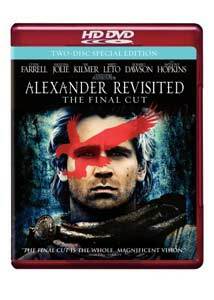 The recut version opens with the death of Alexander (Colin Farrell) at an early age, then flips back to his much earlier triumph against Darius at Gaugamela. The Revisited version is thus bookended by two big battle sequences, the other being a compressed version of several of Alexander's battles in India. In between, it flips confoundingly from time frame to time frame, mixing much later battles with Alexander's youth in Macedonia, especially focusing on his angry relationship with his father Philip II (Val Kilmer) and the politically-charged sorcery of his mother Olympias (Angelina Jolie). At the heart of the drama is the competition between Alexander's love for his barbarian wife Roxana (Rosario Dawson) and boytoy Hephaistion (Jared Leto), as he tries to conquer the known world and keep it knit into a single empire. Stone avowedly was attempting to recreate the giant roadshow spectacles of yore, complete with an intermission (though no overture or exit music). That notion is carried over to the gaudy color scheme that is clearly meant to simulate three-strip Technicolor, as well as the huge battle scenes. These have a problem with coherence, however, since Stone is more interested in the chaos of Platoon than the improbably orderly but at least easier-to-follow battles of past epics. At the same time, everyone seems far too clean in the battle sequences, even when they're coated in ludicrous gouts of bright red stage blood. Matters aren't helped by Vangelis' synth score supported by an orchestra; using a real orchestra throughout would have helped with the parallel much more. While much of the bisexuality of the original was deleted in the "director's cut" version, it's reinstated here, and then some. Unfortunately, instead of racy or titillating, the homosexual aspects of the tale just become dull, with endless scenes of Alexander and Hephaistion languidly lounging about admiring dancing boys. The controversy is gone, and so is the forward momentum, as Stone opts instead to utterly bore the audience. The obligatory and tedious dance sequences of sword and sandal epics were one thing, but watching someone else watch those dances over and over is nothing short of excruciating. Restructuring the entire picture is a rather bold move, allowing Stone to place the dramatic highlights as he chooses and not being bound by strict historical chronology. What is sacrificed in the process is clarity; the most we're offered are cryptic intertitles like "ten years earlier" and the like, making it an ongoing mathematical puzzle as to when exactly the action is taking place. Apparently someone convinced Stone that American audiences don't understand how B.C. dates work, leaving us with fairly incoherent time frames reminiscent of the increasingly deranged date intertitles of Kubrick's The Shining. The second half comes across a good deal better than the first, with several of the highlights coming in quick succession. Even though the battle against the elephants in India seems rather reminiscent of the Ride of the Rohirrim in the finale of Return of the King, it is still powerfully executed, especially in a hallucinogenic sequence after Alexander is seriously wounded. One also gets an excellent sense of just why the phalanx became the dominant mode of combat in the period. The sequence of Alexander dealing with a mutiny of his troops many miles and years from home gives one a rare glimpse of an Alexander who is actually great in some respect, and showing leadership under difficult circumstances. Perhaps the best segment is that between Alexander and Cleitus (Gary Stretch), who confronts the king about his descent into tyranny with deadly consequences; afterward, the realization of what he has done, and of the truth of Cleitus' accusations, finally gives the character a weight and depth that is sadly lacking elsewhere in the picture. The central problem with the movie, which no recutting can help, is that Farrell is not at all capable of pulling off the character; only on rare occasions is he credibly a person of the ancient world, with a tendency to stay a 21st-century person stuck in an absurd set of costumery. Val Kilmer takes Philip and runs with him to a wildly hammy extent, playing the old king like a lusty one-eyed pirate captain. I have no idea if it's a reasonable interpretation of the real Philip, but it's certainly a hoot. Jolie seems to be getting ready for her role in Beowulf more than anything, with a bizarre accent that seems unrelated to any earthly tongue. Only Dawson really seems to live her character, and she gives Roxana a fiercely independent fury, combined with a genuine affection for Alexander. Leto's role is mostly devoted to thankless mooning, with Hephaistion being little more than a caricature. Hopkins seems to be having a good time as the narrator who may or may not have culpability for Alexander's death, giving a good lesson in historiography and the dangers of the unreliable narrator. Despite some decent moments, however, the end result is a sprawling mess that doesn't cohere or make for very compelling viewing. Image Transfer Review: The 1080p picture, rendered in VCI, is nice and crisp, with the scenes supposedly taking place in the Hindu Kush in particular being of breathtaking beauty. Texture and the eye-popping color are often extraordinary. Edge enhancement and digital noise reduction are quite minimal and not obtrusive. There's very little at all to complain of in the video transfer. Audio Transfer Review: The DD+ 5.1 audio track is certainly competent. The tramp of Alexander's army marching is impressive in tonal quality and impact. Dialogue is quite clear throughout. The Vangelis score is the main use of the surrounds, but it comes across with reasonably good immediacy. There are times of solid bass rumble that resonate gratifyingly. Extras Review: A wealth of extra material is present in support of the feature, starting with a pair of full-length commentaries, no mean feat for a three and one-half hour movie. Stone is quite chatty as he discusses the restructuring and what he was attempting to accomplish with the film originally and in the various recuts. Love him or hate him, he's certainly articulate and has plenty of thoughtful observations about his work, making this an interesting listen. The ahistorical elements that were part of the criticism of the film are addressed by historical consultant Robin Lane Fox in a second commentary. Fox cheerily makes observation of the various rewrites of history for dramatic effect, but is more than happy to accept them. He also offers some good background that helps make the timeline far more coherent than the intertitles manage to do. A pair of lengthy documentaries by Stone's son, Sean Stone, take a look at the making of the picture. Fight Against Time: Oliver Stone's Alexander (1h:16m:06s) is an impressionistic kaleidoscope of episodes that is tiring and dazzling at once in its rapid jumping from topic to topic. Behind the Scenes with Sean Stone (1h:26m:41s) uses the same technique in a more restrained fashion, though it's still often difficult to follow due to garbled and often unintelligible audio that is only occasionally subtitled. Oliver Stone's frustrations and creativity definitely come through, as do the issues between father and son that have their parallels in Philip and Alexander. A featurette Vangelis Scores Alexander (4m:29s) offers a brief chat with the composer than gives a little insight into his compositional techniques but not a great deal of substance. The package is rounded out by a nonanamorphic widescreen teaser trailer and an anamorphic widescreen theatrical trailer. None of the extras (except the commentaries) are presented in high definition. Is the third time the charm for Oliver Stone and his beloved historical epic? Unfortunately, no, though the transfer is at least highly attractive, and if you do happen to like the movie there is a wealth of bonus material. So the presentation is optimal, but the film itself still leaves quite a lot to be desired.